I tend to think of US teachers being relatively poorly compensated in our society, especially when compared to say, private equity fund managers. And I always thought that many developed nations paid their teachers far more than we do in the United States. So I was surprised to see that U.S. public school teachers are the sixth highest paid teachers in the world, according this January 29, 2014 UNESCO analysis (p. 254) that adjusts wages by domestic purchasing power so you can compare different currencies and countries more fairly. (Click on the chart to see a larger version where you can read the country names and $$ more easily). 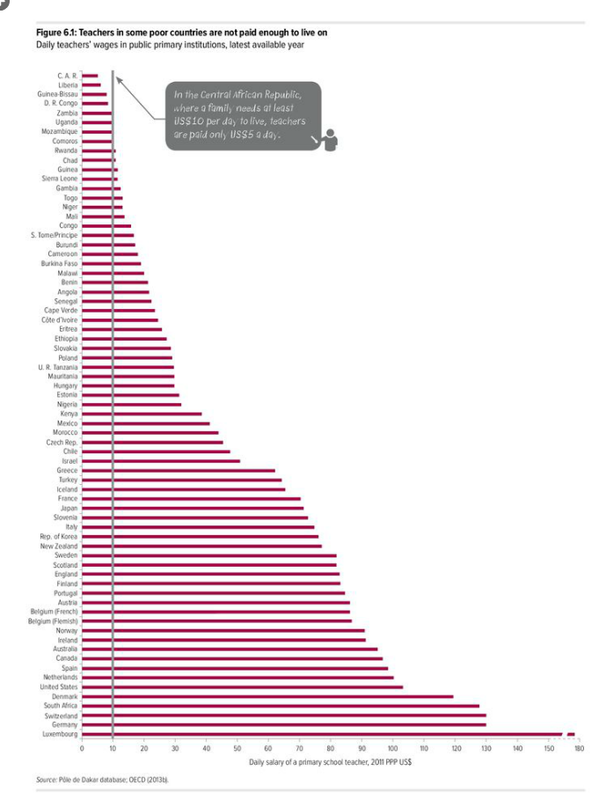 The other interesting thing is that Asian countries, whose students top the international charts on PISA tests, don’t rank highly on this teacher salary chart. The highest paid teachers in Asia are in South Korea, the 21st county on the list.